Minimal clutter for maximum functionality! The blender mix accessory associated with the metal knife improves the emulsion function of the robot. Make with this accessory small preparations, soups, smoothies, homogenize mashed potatoes, compotes and cocktails. Thanks to its citrus press, you can easily make delicious fruit juices. The large tank makes it possible to prepare large quantities and the mini tank is dedicated to small preparations and is equipped with its own metal knife. Nothing's easier! This robot has 3 keys: off - on - pulse. Its asynchronous motor makes it possible to consume the right amount of electricity because the power adapts according to the resistance of the food processed. The supplied accessories are made of stainless steel ensuring a perfect cut. To save space, a storage box is provided. Mini bowl and mini knife - ideal for chopping, emulsifying and mixing small quantities. Metal knife - for chopping, pounding, mixing. Stainless steel made in Thiers for professional cutting. Beater - beat the whites in snow (meringues, mousses...) and whip the cream. Blendermix - for even more creamy pancake, soups and smoothies. Slicing disc - finely mince and shred. Stainless steel made in Thiers. 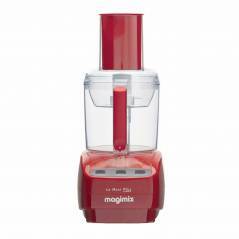 Free app - find all the recipes on the Magimix app available for mobile and tablet. Spatula - to fold down the ingredients and facilitate cleaning.